Oppo Find Z will, as it seems, be the successor to the Oppo Find X. This is well known phone due to the front facing camera's revolutionary sliding mechanism. 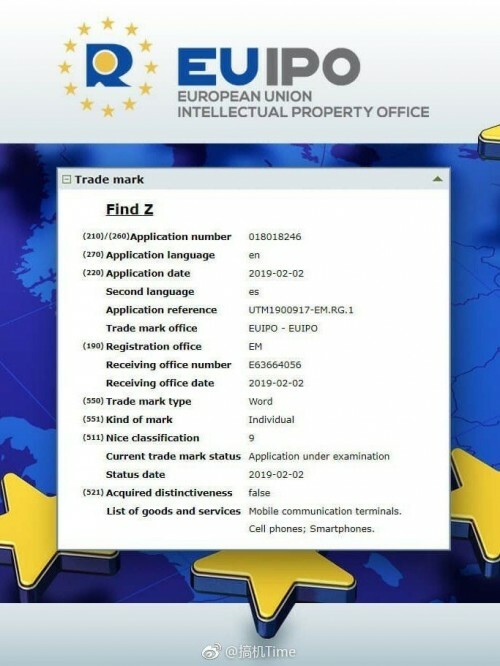 This was revealed to us by the European Union Intellectual Property Office (EUIPO). With the code name Poseidon, the phone has recently showed up on Geekbench running on Snapdragon 855 chipset and Android 9 Pie OS, which is another confirmation that this will be a flagship handset. Recently, we could also see a new 5x optical zoom camera as well an an in-display fingerprint scanner that has much bigger area than before. Another piece of tech that's worth to mention is 50W fast charging that Oppo has recently patented, and seeing that this is a flagship phone, the Chinese company will definitely implement this system in one such device. It is also expected that this will be the first Oppo 5G phone, and rumors point towards this phone having 3 cameras on the rear, one of which will support AR technologies. Anyway, we won't be seeing this phone at the MWC since Oppo still hasn't made it yet – it will have its own dedicated event later on.